One of the first things you may want to consider when discussing the variations between power tools is the concept of ‘power’ itself. How much power a tool is capable of delivering in order to perform a set of tasks? Power is supplied to the tool’s motor as an electrical current, either from a mains supply or via a battery. The motor converts this electrical energy into mechanical energy, which is composed of both speed and torque. Speed is applied in the same direction as the drill is being directed (often called ‘linear’). Torque however is applied from a sideways direction at 90 degrees to the speed. The combination of speed and torque are fed to one or more gears that in turn rotate a chuck and the bit that sits in it. Speed is measured in RPM (Revolutions per Minute). Manufacturer’s specifications refer to a tool’s maximum speed as ‘no-load’. This is the maximum speed that can be attained by the tool WITHOUT encountering ANY resistance (or ‘load’). Torque is best described as the turning or twisting force that the tool can produce and is measured in Newton Metres (Nm) or Inch Pounds. 1 Nm = 8.85 Inch Pounds. It is important to note that the relationship between speed and torque is inversely proportional. More speed means less torque, and vice versa. For example faster speed is better for drilling holes into softer material or driving small screws. 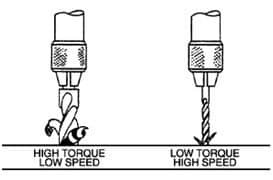 Slower speed (greater torque) is better when you encounter tougher materials that require more turning / twisting force to drill or when you are driving larger screws or fasteners. More heat is generated when greater torque is applied. Gears harness the power delivered from the mains supply or battery and enable it to be delivered across different ranges of speed and torque. Each gear has a maximum rotation speed and torque. For example Cordless Screwdrivers with one gear have a maximum speed of maybe 230 rpm with 10 Nm of torque. However a variable speed general purpose drill driver may have a maximum speed of 2,000 rpm with 80 Nm of torque. Models with more than one gear allow different / greater ranges of speed to be selected, say 0-200 and 0-600 for Cordless Screwdrivers and 0-1,100 rpm / 0-60 Nm and 0-3,000 rpm / 0-150 Nm for Rotary Drills. So for light driving / drilling 1 gear is perfectly acceptable, but 2 gears (and even 3 for professionals) provide more versatility in the number of applications that can be handled. Once you have used the gear selector switch to choose the appropriate gear how do you control how tightly to squeeze the trigger to attain the correct amount of power without over drilling a hole, damaging a screw or work surface or even worse injuring yourself? The answer is to set the correct level of torque on the torque ring (apart from Impact Drivers which do not have adjustable torque settings and work in a different way). Finding this resistance level is down to trial and error to begin with and will depend on the gear setting you have chosen (assuming there is more than one gear), the screw or bit you are using and the material you are negotiating. But the important thing is that when the torque level is reached the motor’s clutch will kick in and disengage the gear to stop the action (not dissimilar to depressing the clutch on your car when the engine is in gear). Often you will hear a click when this happens. So with a bit of trial and error you should have no problem drilling holes cleanly or driving screws accurately.